When you’re craving fresh seafood, but don’t have the time to sit down at a restaurant and eat, we have an alternative option that you might have seen driving around Buffalo before. 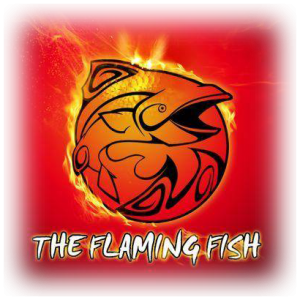 The Flaming Fish is a popular food truck that’s family owned and proudly originated right here in The Queen City. After working at local venues with our three children, we quickly branched out to bigger and better things. The food truck business has taken Buffalo by storm, and we decided to add our unique menu selections to the mix in 2014. Since our establishment, we’re been traveling all over the Buffalo, NY and Amherst, NY areas, serving our customers affordable and tasty seafood concoctions. With options like flaming shrimp, fish tacos, and quesadillas jam packed with your choice of meat or fish, fresh vegetables, and a blend of cheeses, how could you go wrong? 10 Pieces of our specially seasoned and battered fried shrimp, served with your choice of two sides and a dinner roll. Comes with out specially seasoned fried haddock, five shrimp, your choice of 2 sides and a dinner roll. Your choice of tilapia or haddock with served on flat bread layered with french fires, coleslaw and drizzle of hot sauce. Our deserts are all made daily! Check it out at our truck or call and ask what today’s desert is! The Flaming Fish serves a generous selection of food items. We truly have something for everyone, even for those who don’t like seafood. After all, we want every Buffalonian to taste The Flaming Fish difference! Some of the delicious food we have includes fried Haddock, battered fried shrimp and seasoned tilapia. We provide lunch and dinner for the Buffalo and Amherst, NY area.